G4 has changed a bit since its birth in the TechTV days, but its new app is absolutely packed with features and awesomeness. Videogame fans have long had to deal with the mobile versions of popular gaming websites, such as Gamespot or G4's own version. These were often clunky and slow even on the latest phone. Navigation was a nightmare and often video was left out entirely. Join me past the break to discover how G4 has shown the gaming press how its done. The app takes a few seconds to load the first time, but after that it starts up pretty much instantly. Your home screen of sorts contains a scrolling ticker of picture links at the top, not unlike what we found in Pulse. These are typically the biggest stories, such as the recent Bioshock : Infinite announcement. Below it is a more standard scrollable list of the latest news, articles, and other tidbits that G4 posts throughout the day. Hitting the menu button will bring up links to the other main sections of the app, which include videos and a games finder. 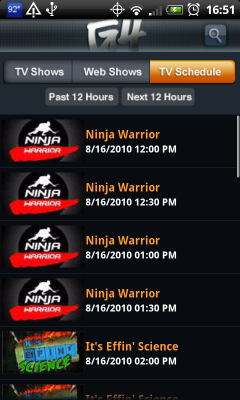 Hitting on "more" lets you access pages for specific G4 shows as well as a schedule of their programing. Going into the "Games" section, you can quickly find games under "Most Popular" or "Most Recent," which seems to be a list of games that have recently released. You can further refine these lists by selecting a platform of your choice. Each game has its box art, name, platform, release date, and score (if reviewed) for quick reference. 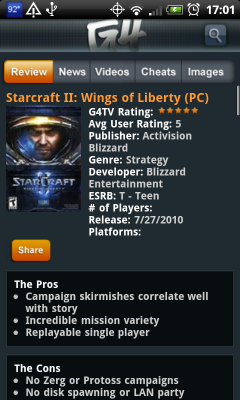 Tapping on a game (in my case, StarCraft 2 because it is amazing) brings you to that game's hub. From here, you can quickly read the review, find news, or watch any related videos of that game. In my case, SC2 brought up the video review, the amazing trailer (which you truly need to watch), a clip of Morgan Webb and Kevin Pereira talking about the game, and a couple other interesting pieces. Video quality on my Droid Incredible was great over Wifi, with the video starting after only a few seconds and suffering from no lag or jitters once it did. Honestly, their video streaming is at least as good as what you will find in the native YouTube app, if not better. The "Videos" section works much the same way. 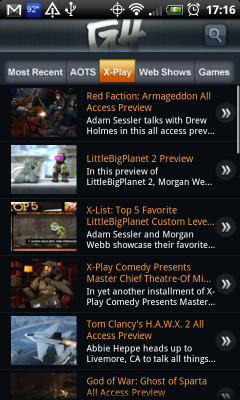 You can browse by most recent or delve into clips specific to G4's most popular shows: X-Play and Attack of the Show (AOTS). There is also a tab for G4's web shows if you are interested in those. Another great feature is the ability to search from anywhere in the app by hitting your phone's "search" button or hitting the little search icon present in the top-right. 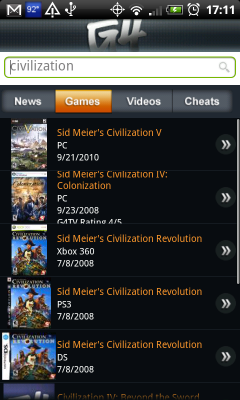 Using this, I was quickly able to find articles about Civ 5, for instance.